There is something about Harbor Springs that captures the eye of artists. Northern Michigan's natural beauty with breathtaking views, sparkling water, dramatic countrysides, and four seasons of color to enjoy makes artists smile. And those smiles are transformed into a variety of artist forms. And galleries! Yes, the Harbor Springs area is the home to some of Northern Michigan's most creative art galleries. Harbor Springs is known for art as well it should be. The artists who call this charming town home may have their own galleries, a place for both creating and showing. Harbor Springs area art galleries exhibit truly amazing artwork from around the country. In the art world, artists and art lovers know of Harbor Springs and the art and artists that work and show here. Strolling the beautiful downtown district hugging the waterfront can offer the chance to see oils, pastels, jewelry, bronze castings, glass, watercolors, and even metal work. An afternoon in Harbor Springs is a bit like a visit to an art museum because of the variety of work that can be seen. Beveled Edges Custom framing for all styles of projects takes place at Beveled Edges. Here you'll find the creative work of owner Trude Bigelow. Trude's oil paintings capturing the scenic glory of Northern Michigan are collected by local and seasonal residents as well as visitors as a reminder and celebration of this region's beauty. Boyer Glassworks Harry Boyer's working glass studio is the place to see fabulous glass pieces along wit Harry actually blowing glass. Harry's glass work fills the shelves and don't miss the annual Great Lakes Glass Pumpkin Patch in October. Visit Boyer Glassworks. Coyote Woman Gallery The Soul…Spirit…and art of America, featuring original oils, watercolors, acrylics, pottery, sculptures, and dazzling one-of-a-kind designer jewelry. Also find Affordable Framing at the back. Hanni Gallery Discover our unparalleled collection of American made fine craft. Featuring the work of more than 150 artists from around the country, including jewelry crafted by local artist Hanni Yothers. Glass, pottery, inspirational gifts, garden art, jewelry, fine woodworking, and Petoskey stones. New location on Bay Street. Hramiec Hoffman Fine Art and Craft You won't miss this gallery's bright green building--complete with a robin sculpture in the front--on M 119 as you head into Harbor Springs. The gallery is filled with the works of Mary Hramiec Hoffman: oils, giclees, prints, books, note cards, and more. 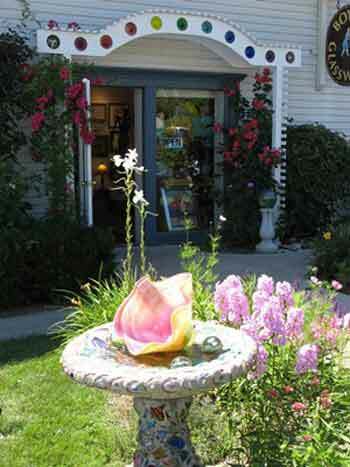 Visit the Hramiec Hoffman Fine Art and Craft on your next visit to Harbor Springs. Knox Galleries is the nation's premier monumental bronze sculpture gallery. Intimate gallery featuring life-sized, exquisitely detailed bronze works plus paintings from a sample of the world's finest artists. Enjoy the outdoor sculpture garden featuring bronze works and kinetic sculptures. Peery Gallery Jim Peery's gallery on Main Street is beautiful and his work is impressive--impressionist, expressive, inviting. This is a working studio and throughout the year, you can find Jim at work in this creative space. Pierre Bittar Gallery French Impressionist, Pierre Bittar founded his art gallery in 1992. He exclusively showcases his artwork of the Harbor Springs area, France, and Italy. Also portraits and landscapes on commission. Three Pines Studio A working studio and gallery in the arts and rafts tradition featuring more than 50 local artists. Workshops and demonstrations in basket making, clay, drawing, fiber, glass, and painting scheduled throughout the year. Located in Cross Village. Great workshops so check out the 2014 Workshop Schedule. Tvedten Fine Art Gallery Michigan's best artists displayed in a beautifully restored 1910 downtown horse barn now an art gallery. Originals in a variety of mediums, many featuring Northern Michigan scenes. Custom framing. West Wind Atelier Elizabeth Pollie's work is stunning on the walls of this spectacular Harbor Springs gallery. West Wind Atelier also features the work of other accomplished artists such as Caesar Citraro. Check the website for special exhibits and workshops in the gallery. Witty Galerie Trisha Witty has been delighting summer visitors and area residents for more than 20 years with her creativity and talent.